Only recently has the Pentagon been willing to let lesbian, gay, bisexual and transgender Americans openly serve in the military, but it seems the Defense Department still isn’t too keen on the LGBT community. John Aravosis of AmericaBlog writes this week that a handful of gay-friendly websites, including one for an association of actively-serving LGBT military personnel, has been blocked from Pentagon computers. “It’s bad enough the United States Department of Defense censors Towleroad and AMERICAblog – banning the gay civil rights Web sites from being accessed on DOD computers – and it’s even worse that the Pentagon has no problem permitting their computers to access Ann Coulter’s and Rush Limbaugh’s hate-filled Web sites,” Aravosis writes. Outserve.org, the website for an organization with 4,000 members and deemed “one of the largest LGBT employee resource groups in the world,” is also inaccessible through the Pentagon. Outserve describes itself as working to support “a professional network of LGBT military personnel and create an environment of respect in the military with regard to sexual orientation and gender identity.” Aravosis adds that Outserve has also been an active opponent of the military’s Don’t Ask, Don’t Tell policy, the ban on openly serving that has only recently been lifted. According to AmericaBlog, the communications director for OutServe-SLDN confirmed through one of their military members that their site is indeed blocked by the Pentagon. “I wonder if the Pentagon has a censorship category titled Jewish, African-American, or ‘Latino,’” Aravosis asks. Although all Americans are now open to serve in the military, the Defense Department seems to be rather selective with what kind of content — even content geared towards its own personnel — can peruse. 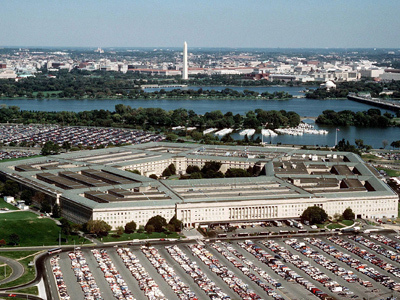 “The LGBT filter existed before the repeal of Don’t Ask, Don’t Tell, but still has not been fixed.And the Pentagon was notified of the problem as early as last summer, 2012.Yet no one’s gotten around to doing anything about it,” he writes. The screenshots published on AmericaBlog reveal that the Pentagon relies on California-based Blue Coat Systems, an Internet security company, for its Web filtering. Investor’s Business Daily notes in a 2009 article that Blue Coat has at one time or another provided services for major corporations, governments and telecom companies, including AT&T, Verizon and Sprint. They are perhaps best known, however, for a 2011 exposé in the Wall Street Journal that revealed that products distributed by the billion-dollar IT company had made it to Syria, where the government was implementing those tools to spy on citizens. A trade embargo between the US and Syria would have prevented Blue Coat’s products from being used, but company executives nonetheless confirmed that at least 13 devices were being used in Syria at the time of the article. On their website, Blue Coat has published a statement that advises their clients that websites branded as “LGBT” do not necessarily warrant censoring. “Of course, if the software company the school used had not provided them with the tools to specifically censor LGBT websites this might never have occurred,” added Willis.